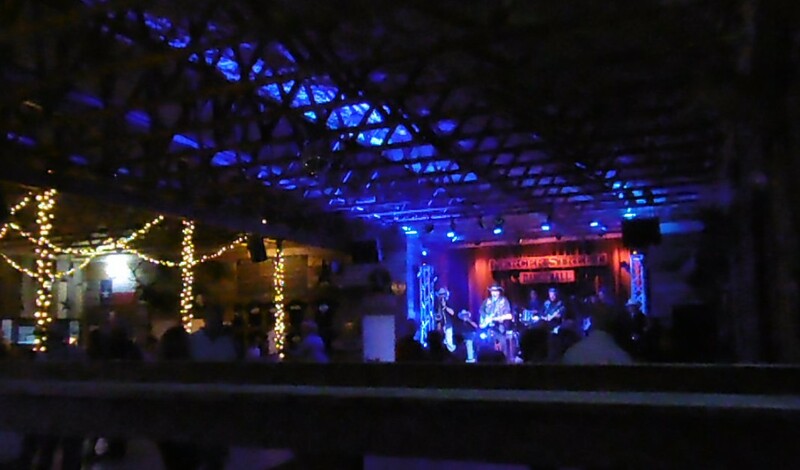 Saturday night in Dripping Springs, Texas. It’s not, as you might think, named after the effect of high-summer heat and humidity on the human body. No. 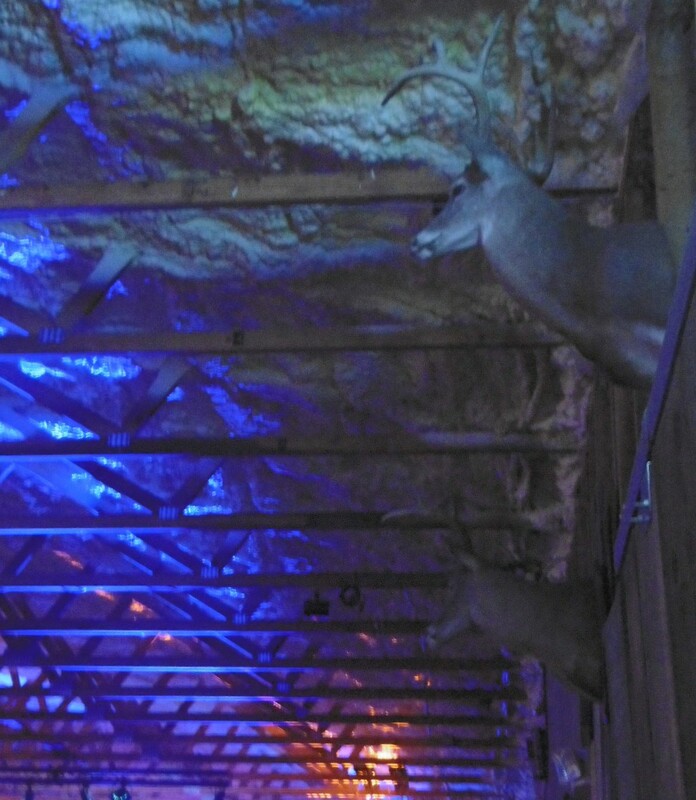 It’s Dripping Springs because of the fresh water that attracted the first settlers. Well, first after the Native Americans they displaced, that is. There’s no let-up as dusk shimmies into evening. It’s probably not 100˚F any more, but idling around the 97 mark, even though the sun’s gone down. I still feel as if I’m walking through curtains of hot, damp, translucent suede. In the sultry gap between the footpath and the silent banks and cafes, tired, dusty bushes are alive with butterflies. Fritillaries flickering orange in the glow of après-sunset. Burnt orange. The University of Texas American football team colour. About the only resemblance imaginable between the dainty winged ones and those incredible hulks. We’re heading for a plain, rural-industrial looking building, set back off the street. Seven of us. Four siblings, the rest in-laws. 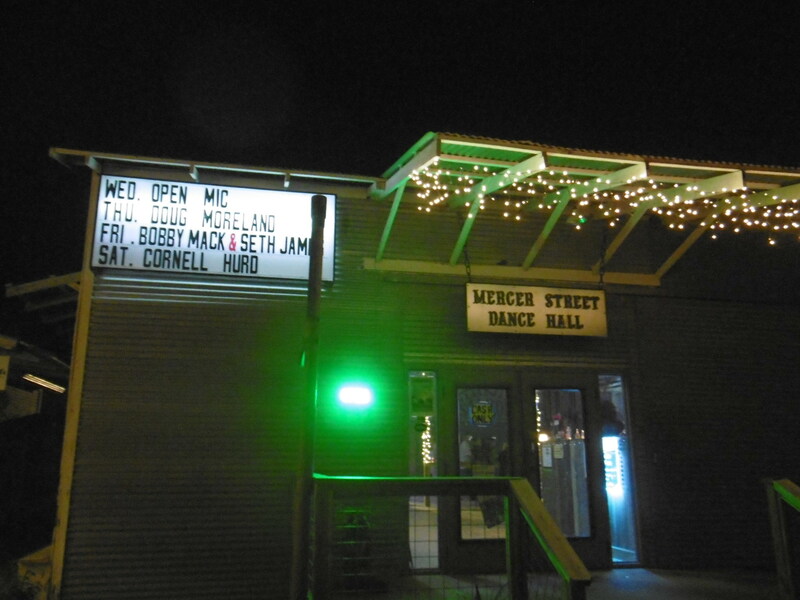 For $8 each we get a blue wristband and entry to the Mercer Street Dance Hall. It’s cavernous inside. Dark but strung with bright lights. A party in the making, awaiting the spark of the live band to set the spirit alight. On the square dance-floor that fronts the stage several couples are taking advantage of a group dancing lesson. We, meanwhile, head for a corner table that’s big enough to fit us all and afford a mighty fine view of the action. 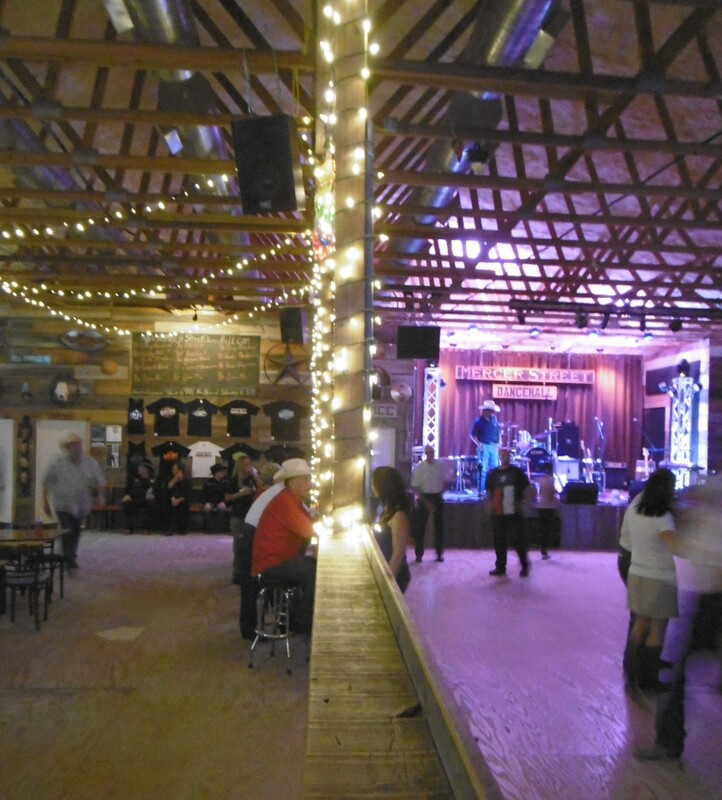 Trust me, it’s hard to take a decent pic of a dance hall – even before the band starts! There’s a full bar in the far corner – but this ain’t a glass of wine evening. 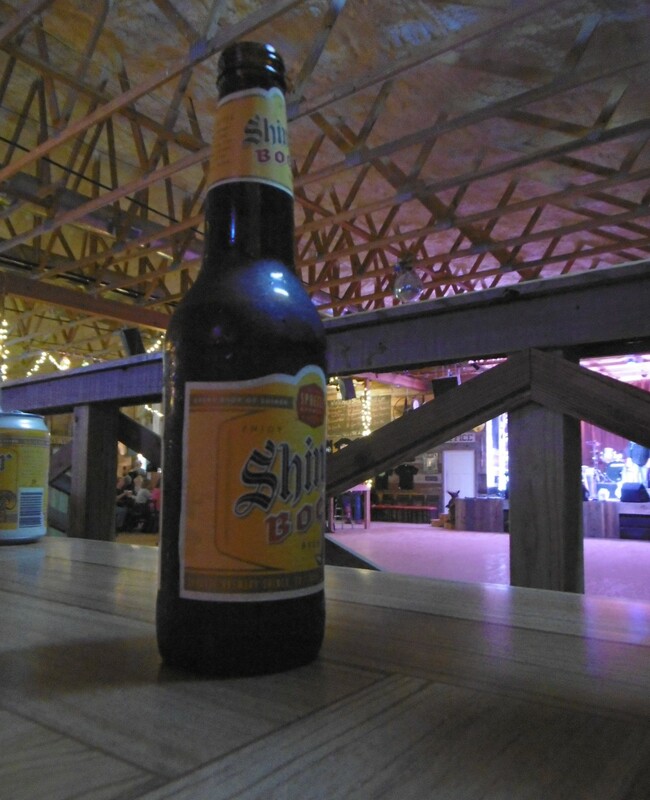 Shiner Bock. Hot weather beer. We’re served the last two bottles – nothing but cans left now. And no-one wants cans. But tough. It’s still beer. Dancing lesson over, much twirling accomplished, our band takes to the stage in a storm-cloud of black. There’s a crowd of them. Seven gui-tars (one slide), a saxophone and drums. Men topped country style by hats. Black hats. White hats. I suspect there isn’t an official collective noun for them – but ‘swagger’ feels kinda right. Chords of country and western instantly perk up the vibe – but the empty square makes me feel uncomfortable. Is the band going to bomb? Doh. My slow-witted (jet-lag no excuse by now) mind joins the dots. 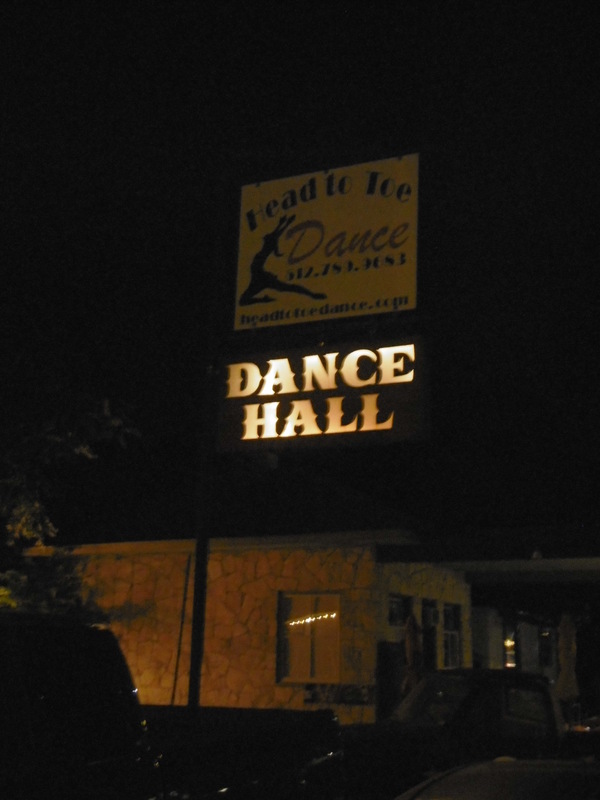 It’s a dance-hall. There will be dancing. Around the edges people of all ages – except local teens, who’d have to pay more to enter because they can’t buy beer till they’re twenty one – sit waiting. Patient and eager. Primed for the Texas Two Step. The band’s well-known in these circles. It’s been around the block more than a few times. By the time he’s said it three times we’ve got the joke – so old he’s losing his marbles. Making the most of his longstanding career and getting a good laugh each time for his growing-old pains. The dance-floor’s sparsely strewn with couples for the first number. But as the main man reminds the crowd, this is ‘Texas, where we never quit dancing with our women’. Bobbing heads under gleaming white Stetsons spin like tops, a respectful country distance from their women folk. Some of the younger females wear dainty little cowboy boots on short-skirted legs. Not me. Sloppy sandals unfit for dancing. But I manage a waltz. Sort of. There’s a fine cast of characters for the people watcher (me). See over there? That man’s the spit of the guy at the bowling-alley bar in The Big Lebowksi. A long white moustache droops down his face under the camouflage of the obligatory white Stetson. His partner snuggles up most un-country close. So close, with her own large Stetson blending into his chest, her body draped in a voluminous sequinned top, that no face is visible. Is he dancing with a teddy bear, I ask? ‘Does she have leprosy?’ responds a relative – who shall remain nameless. 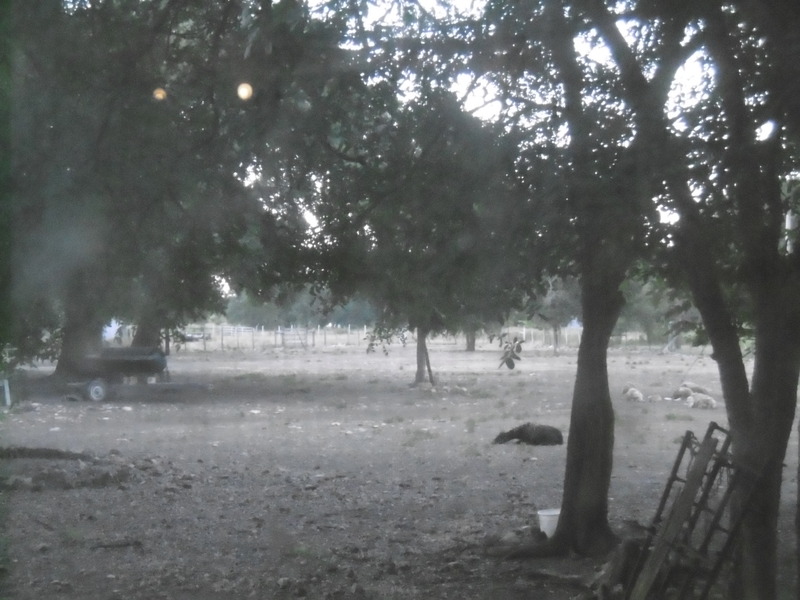 When the band takes a short break I notice the window behind me is just wire mesh, like mosquito mesh in Zambia. Peering through it, into the greyness that at last signifies night falling, I can see dark lumps lying here and there on the ground. Yes, sheep. Lying there, motionless, log-like. As the crowd grows bigger and part of our table’s purloined – politely – by a big group in party mood, we move, reluctant but still jet-lag tired, towards the door. 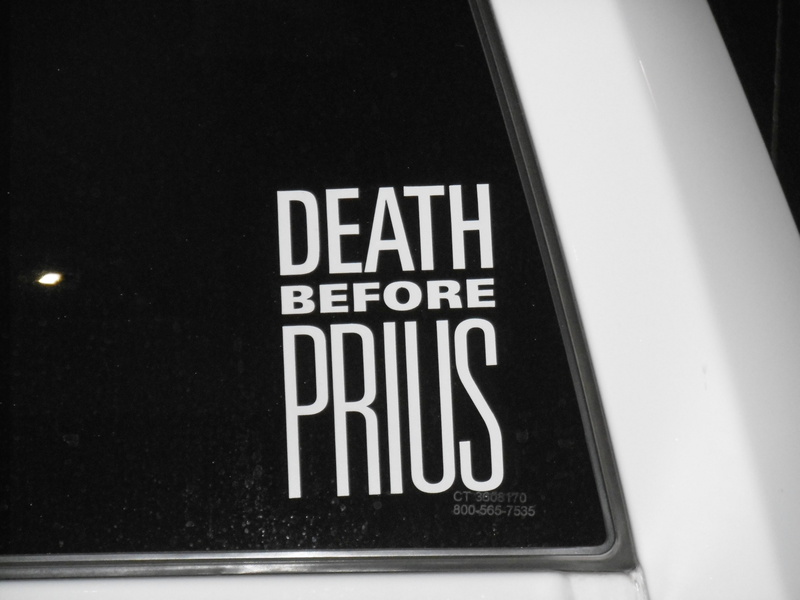 Outside a big white pick-up truck bears a sticker that says a lot about this part of the world – well, some of its denizens. Yes, the land where some people would have you prise the guns out of their cold, dead hands rather than give them up, has a bit of a love affair with these gas-guzzling beauties. Guns are a different matter. Today, shopping in ‘Cowgirls and Lace’ (just research, of course) my sister-in-law pointed out a beautiful, smooth leather case. Embroidered and closed with a zip. Turquoise – my favourite colour. It wasn’t a handbag – or purse. It wasn’t for make-up, or manicure implements, or any such frivolity. This was a girlie case for your feminine pistol. Gotta love lots of things about Texas. And the USA. But guns ain’t one of them. *But I wouldn’t give in. I care for the environment, honest. This entry was posted in Art, jaunts & going out, Texas, Travelling and tagged Cornell Hurd Band, country music, Cowgirls and Lace, Dripping Springs, fritillaries, Mercer Street Dance Hall, Shiner Bock beer, Stetsons, Texas, Texas two step, The Big Lebowski. Bookmark the permalink. You nailed it. Cornell Hurd would be proud. You captured the evening. Well done! Looks like fun, and terrible dancer that I am I would have still wanted to give it a badly executed whirl! Delightful as your description is and despite new figures for Australia that gun ownership is on the rise with one gun now registered for every nine residents, a turquoise pistol case isn’t on my Christmas list. 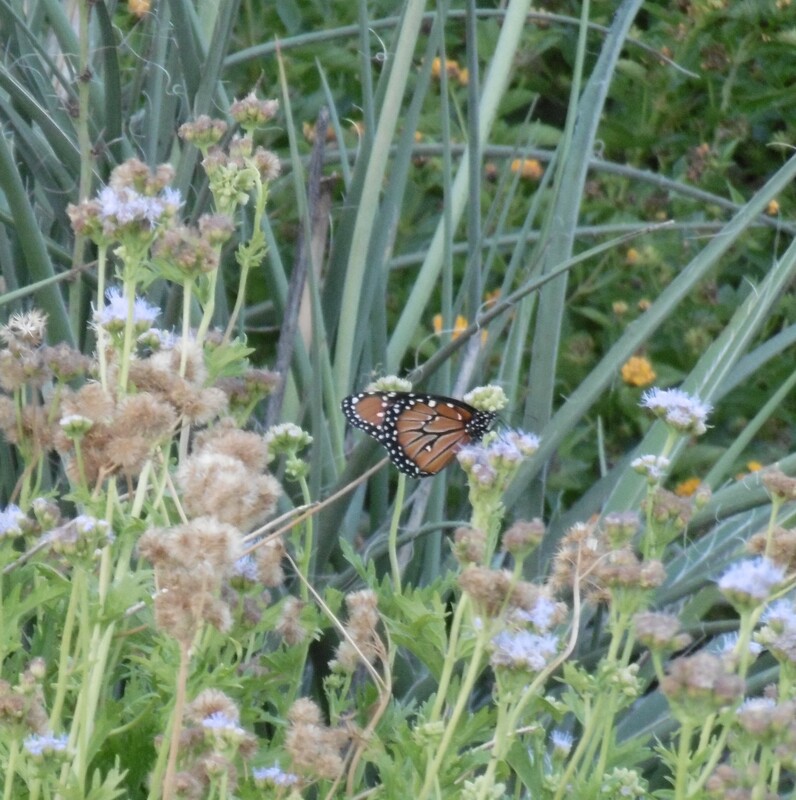 What I was really happy to see was the Monarch butterfly and your report “dusty bushes are alive with butterflies” indicating like you they are spending time in Texas. I’m a lousy dancer too but have resolved to try and learn the two-step for next time. The turquoise purse did creep me out – Texas has rather liberal gun laws and it is disquieting to know they are all around you a lot of the time. So, yes, the butterflies were a nice contrast – though I was told the monarchs have been less plentiful this year – this part of the country is on their migration route. Despite the heat when we were there they had heavy rains earlier with disastrous consequences for a nearby town – water – too much or lack of it – is a big issue here and now even more so in California. There are things to be said for our rainy but temperate climate in NW England! Where at the moment I suspect it’s a bit like your current winter. Well I got that wrong – no snow – yet … Of course there’s no such thing as climate change is there? Watched a disturbing programme on the jet stream last night. Another thing to add to the list of anxieties! Crikey Charlie, well fitted in! I like San Antonio – where the rellies used to live. The cathedral, the Alamo, the missions. The Riverwalk. Austin is where Archaeo-man was an undergraduate – it used to be a very laid back hippy-ish city but has had an influx of high-tech buisness immigrants fleeing pricey California over the last few years and the traffic is dreadful. It’s still great for music though.